Indian Language Technology development on Digital medium is one of major thrust areas of DeitY, Government of India. Under the aegis of Department of Electronics and Information Technology, Government of India several Research initiatives are being carried out in Indian language computing with participation from country’s premier R&D institutes. In order to scale up further and boost the usage of Indian languages on the digital medium several tools and technologies are being made available for public usage. Aligning with the above goal, “Urdu language Fonts and Keyboard Drivers” for different medium are being released for the benefit of common man and in turn bridge the digital divide. Content creation and consumption is one of the major requirements for language growth and keeping with this in mind as a first step Urdu Fonts and keyboard drivers are being released. C-DAC GIST has developed android apps for Children Books in Urdu Language. These books made available by NCPUL. The children books are appropriated for Android phone or tablet which have installed the Android system 2.1 or above. CDAC-GIST, TDIL Programme, DeitY and NCPUL, MHRD Govt. of India is pleased to announce the “Urdu Content Creation Framework based on MediaWiki” for public access. One can visit http://urdupedia.in in order to create & access knowledge resources on various subjects such as Literature, Science and Social Science etc. The framework is powered by MediaWIKI platform and CDAC GIST has provided facility for Urdu support by integrating “Onscreen Urdu language” keyboard and “Unicode compliant Font”. The “Urdupedia” will catalyze the process of content creation in Urdu language and over a period of time Urdupedia will be enriched with varied contents in all the fields nurtured by NCPUL. This provides an opportunity for Urdu speaking communities to collaboratively create a knowledge repository of Urdu Language and the associated history and culture. This content will be moderated by experts of NCPUL. The font is the first contact, which the user makes with an application on his screen, and largely it is the choice and attractiveness of the font, which makes the application visually appealing. The beauty and the aesthetics of a font are closely intertwined and are dependent on the font designer. CDAC, GIST has always kept these factors in mind when designing the font, which has maximal visual appeal and readability. 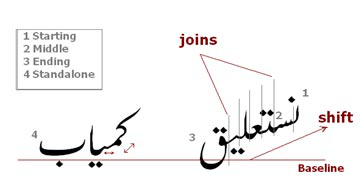 Naskh : Naskh though cursive is linear in nature. Each letter joins to the next moving from right to left. The glyphs change shape according to the place they occupy within the word. Strictly defined by norms laid down by tradition, the visual beauty of Naskh lies in the seamless manner in which each letter joins to the next letter to create a text which is as attractive as a visual drawing. C-DAC GISTs Keyboard Manager gives freedom to the users for Creating Contents, write e-mail, chat in Urdu using UNICODE compliant software. Urdu by nature is written Right to Left. GIST's Keyboard Manager is capable of handling these Right to Left (RTL) scripts on any existing UNICODE compliant application, running under language enabled Windows such as - Notepad, MS-Word, etc in Windows 2000, XP, Vista, Windows 7 and Windows 8 and above editions. Using Unicode enabled web-content creation tools; user can also create HTML documents which can be published on the Web / Internet. The documents, letters and data created using C-DAC GIST’s Keyboard Manager are UNICODE based. User can use the application to type in various layouts such as INSCRIPT / PHONETIC / CUSTOM by pressing either Capslock / Numlock / Scroll Lock and can switch to English as and when required. The tool also comes with Virtual Onscreen Floating keyboard for click-typing or easy reference. Keyboard standardization is one of the three pillars on which all content creation and localization rests, since the keyboard ensures that the characters pertinent to the language are adequately and correctly represented and provides the means of inputting the same. Unicode is the de-facto standard for representing the code-set of a given language and since Unicode keeps evolving through different versions, it is indispensable that the keyboard for the language is constantly updated to represent the changes in Unicode. 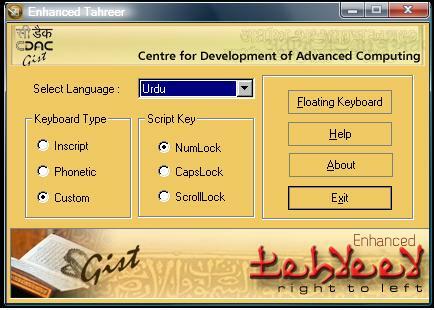 The very first keyboard for Urdu was developed on the Gist Card in the late 80’s. With the growth of digital technology, a plethora of keyboards were developed both in India and abroad. The need for a standardized keyboard is two-folds. On one hand, there is no Indian standard for Urdu keyboard. This lack of a standard to which all software developers need to comply, as in the case of Brahmi-derived scripts is a major lacuna which needs to be addressed. Standards ensure that different applications and operating systems talk to one another and exchange data seamlessly. On the other hand, the keyboards need to be Unicode compliant and also permit the incorporation of the Indian Rupee symbol on the third layer. Unicode is now in version 6.2 and the keyboard for Urdu needs to reflect the latest changes and updates for Urdu. It is with this aim in mind, that a keyboard standardization initiative was taken and C-DAC GIST has started the exercise for Urdu language. The design of this keyboard also following the same principle; based on frequency as of INSCRIPT keyboards, is Unicode compliant and above all ensures that the same keyboard can be deployed for hand-held devices, tablets and Smart-Phones. This keyboard layout as of today is in the process of being standardized.